Toyesi are invested in R&D and together with Pure Aquatics can now offer Toyesi heat chill units and environmental temperature and ventilation control solutions for your facility saving energy, water and equipment repair costs. When it comes to aquaculture heating or chilling, you can trust Toyesi has the ideal system to suit your application. Innovative and versatile, the Trident Series extensive range of aquaculture heat pumps offer superior flexibility of being configured quickly, making it the perfect solution to a variety of diverse domestic, commercial and industrial applications. Easy to install and simple to maintain, you’ll find the Trident Series a pleasure to work with. Regardless of the site’s landscaping or site design, Toyesi has over 40 different model capacities from 6kW to 300kW and up in both outdoor and in-plant models; with either side or vertical fan discharge configurations available, and a choice of titanium heat exchange technologies. This system offers many features found in Toyesi’s renowned high-end systems, including variable fan speed noise control, advanced refrigerant management technology and sophisticated state of the art digital logic controller option aimed at delivering enhanced operating efficiencies that maintain capacity during critical periods. They are uniquely designed in a slimline and compact chassis suitable for limited plant space requirements. Be assured that installation, commissioning and maintenance issues are fully supported by our technical sales engineers, making Australia’s Trident aquaculture heater – chiller heat pumps the right solution for every kind of project. ✓ Heat and cool operational modes. ✓ Multi-stage and/or capacity units. ✓ Proportional water valve operation. ✓ Programmable digital clock timer. ✓ Placement outdoor or in-plant (room). 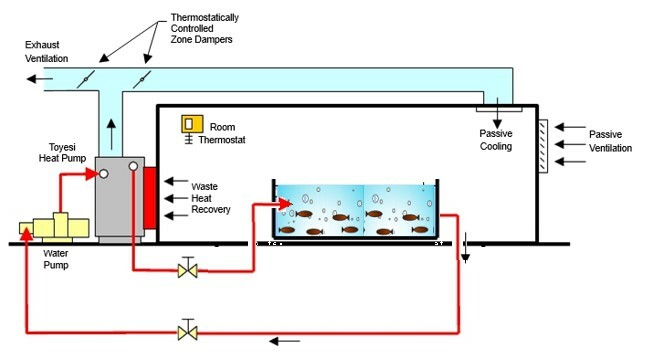 o Ventilation and waste air recovery. With experience dating back to 1989 Toyesi has been building and designing Heat Pumps solutions to suit a wide range of problems. • Some installations will provide reusable clean condensate water – great for top up tank water. Our range of PCVER indoor models are aimed at providing a comfortable environment by reducing both temperature and humidity within the enclosure, whilst recovering waste heat that’s typically exhaust ventilated from the enclosure. • Economically heating one or multiple tanks and circulating water system. • Exhaust ventilating the aquaculture enclosure. • Semi-conditioning the enclosure by passively dehumidifying and cooling the recovered air. • Recovering waste heat from the enclosure to improve operating efficiencies. • Improving indoor air quality by ventilating and reducing humidity levels. • Minimising structural damaging effects of condensation. • Operating into extended periods due to lower noise emissions (ducted models only). • Set up as a dehumidifier and even Air-born waste water recapture and reuse. Are you frustrated because of your current split system air-conditioners breaking down, rusting electronics, shorting out, all due to high condensation and room moisture? • Water damaged wiring and parts. • Large service and maintenance bills due to frequent ongoing service needs. Process Air System (PAS) Internal Tropicalised Environmental Conditioning System is the solution for you. Through the invent of our PCVER System designed to provide Process Circulation, Dehumidification, Energy Recapture and reuse of not just water but of air supply as well. We were able to utilise the lessons learnt from our PCVER System to give life to our New Range of Process Air Handling Systems or PAS Units. PAS Units are genuine commercial grade Air Handling Systems and not just not Air-Conditioners. With critical components kept well away from the internal space, the PAS Units can maintain a wet and humid environment, utilising advanced reverse cycle heating and cooling technology to economically maintain the internal environment without all the headaches and maintenance issues. – Electrics outside and not effected by internal moisture build up. – Long Lifecycle – designed to outlast traditional air-conditioners in damp, humid or wet areas. – Variety in Sizes – With various sizes to suit most applications.